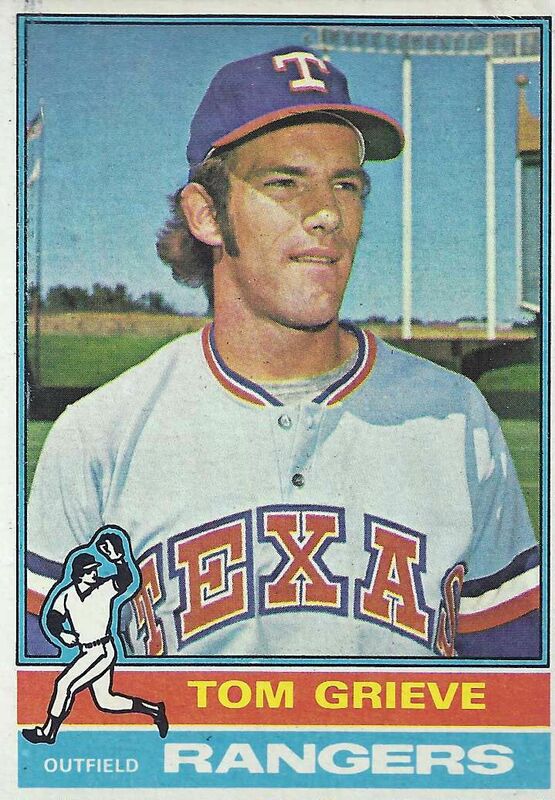 Texas Rangers Cards: 1976 Topps - Tom Grieve. 1976 Topps - Tom Grieve. Tom Grieve, shown here on card 106 of the 1976 Topps set, had five Major League seasons under his belt going into the 1976 campaign. He had yet to nail down a starting job. After some modest success in 1975, this was Tag's chance to grab an outfield spot. Grieve would play in a career-high 149 games in 1976 and make a career-high 600 plate appearances. Unfortunately the results were mixed. Tom led the team in home runs with 20. He also hit 23 doubles and three triples. His 81 RBI were second best on the team. Those were the positive numbers. On the other side of the equation was his .255 batting average and .301 on-base percentage. Both were lower than the previous year. One contributing factor was his 119 strikeouts, up from 74 in 1975. Unlike the previous year, Tom only played the two corner outfield positions in 1976. All told he put in 431.1 innings over 52 games in the outfield. His .983 fielding percentage was just two points higher than the league average. If Tom Grieve had a starting job in 1976 it was at Designated Hitter. He played in 96 games there, 95 as a starter. Unfortunately his bat betrayed him. At 28 years old the former first round draft pick appeared to be headed back to a back-up role in 1977. I think 1975 was the only year the Rangers wore the jersey Grieve is wearing on this card. Glad to see the blog is back up and going again. Thanks. 1976 Topps - Roy Howell. 1976 Topps - Toby Harrah. 1976 Topps - Mike Hargrove. 1976 Topps - Steve Hargan. 1976 Topps - Bill Hands. 1976 Topps - Jim Fregosi. 1976 Topps - Steve Foucault. 1976 Topps - Bill Fahey. 1976 Topps - John Ellis. 1976 Topps - Mike Cubbage.